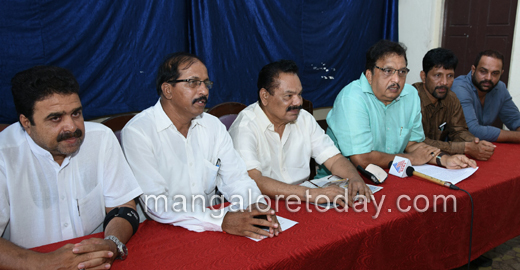 Mangaluru, Oct 24, 2016: District JD(S) President Mohammed Kunjhi strongly condemned the comments of Senior Congress Leader Janardhana Poojary over JD(S) supremo HD Devegowda. Addressing media at Hotel Woodlands on Monday October 24, he recalled Janardhana Poojary’s comment which stated that, HD Devegowda led JD(S) is hatching conspiracy to destabilise Congress party. Reacting to the comment Mohammed Kunjhi said that, Congress party is destabilised due to inner disputes within the party but not through JD(S). It was an unexpected comment from the experienced Congress Leader B Janardhana Poojary. During his recent visit to Mangaluru HD Devegowda clearly mentioned that minister who are willing to join JD(S) are welcome and will not be forced. There is no point to blame Devegowda for hatching conspiracy to destabilise Congress and demanded to take back his statement, said Mohammed Kunjhi. JD(S) leader Amarnath Shetty said that, entire JD(S) party is saddened for Poojary’s remarks over Devegowda. Ivan D Souza, Suresh Ballal were also belonged to JD(S) before joining to Congress whether they have been forced to join Congress, he questioned. Poojary was an corrupt free politician and worked hard to strenghten the Congress party but today Poojary is sidelined by their own party and Poojary should not have commented on Devegowda, he added. Akshith Suvarna, Aziz Kudroli and others were present.